ATTACK OF THE J-POP FRIDAY - BOOTED BABE, BUSTED BOSS! 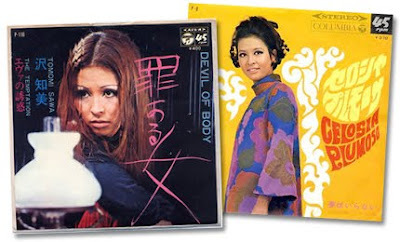 First off, the lady in question is Tomomi Sawa, a baby-faced beauty and ex-model who carved out a career as an actress and pop-singer during the closing gasps of the swinging 60's and the bright early days of the slushy 70s. According to IMDB she only had one movie credit - 1968's 100 Shot, 100 Killed - Goldeneyes - from whence the above clip hailed. More of that later, although some rummaging around has uncovered a few more appearances from today's womanly warbler - notably (and courtesy of Google translator) Receipt High School Outlaw (1972), Market Women to Launch a Night (1969) and the evergreen classic Horse Comic One-Shot Winning Strategy (1968). Whether these are movies, TV shows or just someones idea of a good time is entirely open to question - and if there are better translations of the titles out there I don't wish to know them. I'm certain a good time would be had by all once I've tracked Goldeneyes down, but save for an unsubtitled (boo!) Japanese DVD which retails the wrong side of £50, it's a tricky title to nab. 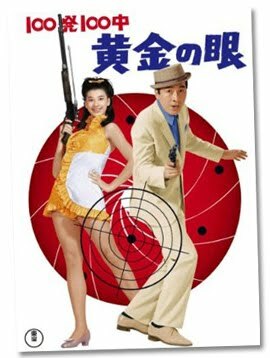 100 Shot 100 Killed, Goldeneyes was one of many Bondalikes from the height of the Connery-era 007, this one from top Japanese studio Toho. Almost inexplicably it received the dodgy dub treatment for a Western release as the brilliantly titled Ironfinger, Booted Babe Busted Boss - but whether it actually made it all the way to the UK circuit is unlikely. 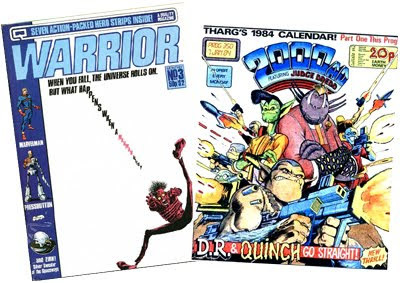 You've gotta admit, that looks like a lot of fun, with pistol-packing perky fems complete with squeaky chipmunk voices, imminent danger from deadly hairdressers and stacks of gun-totting rough and tumble action, despite an apparent lack of booted babes or indeed busted bosses. 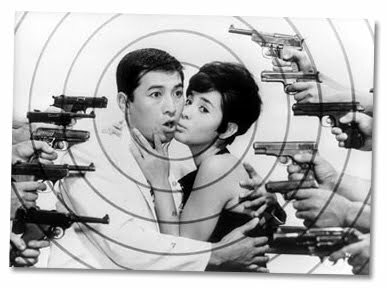 It's actually a sequel to an earlier Toho action epic - 100 Shot, 100 Killed / Ironfinger - which featured the luverly Mie Hama the year before she co-starred with Sean in You Only Live Twice. So there. Both films were directed by ever-faithful Jun Fukuda, who also gave us a whole slew of Godzilla movies - including Vs Mechagodzilla - not to mention some episodes the Monkey TV show. 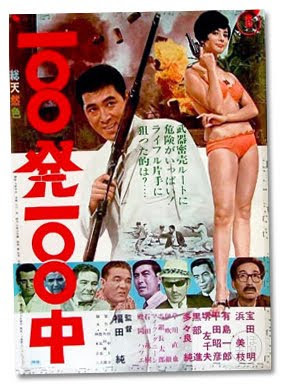 The original 100 Shot 100 Killed received an English overdub too (perhaps in part due to Hama's pre-Bond presence? ), but so far has only turned up that way on - of all places - an out-of-print Indian VCD with the print so washed out and faded to red that everyone looked embarrassed by their involvement. As previously discussed way back when, and returning due to popular demand, here's some dyed-in-the-wool Bollywood insanity with the flamin' hot Zeenat Aman busting moves blind. Since the clip originally posted has been long since yanked off Youtube I thought it deserved a revisit, and thankfully another happy-go-lucky uploader - the bombastic Bollytunes - has stuck up their own copy. Since I've refrained from posting any mind-blowing Bollypop for quite a while may I humbly attempt amends by throwing forth perhaps my favourite number from most definitely one of my favourite Masala Mash-ups - 1972's flippin' fantastic Apna Desh. 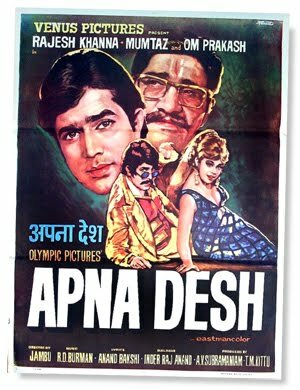 And of course, you know by now - the title may change but the credits are invariably the same: dynamite husband & wife duo Asha Bhosle and RD Burman, clearly the most rip-roaring of all musical couplings, once again did duties on playback. Frankly, you'll probably need a nice cup of tea and a sit down after the combined force of those two. Sometimes I impress myself with uncharacteristic bad timing and all too typical buffoonery. 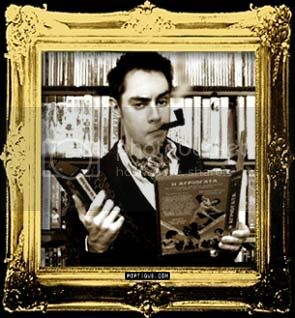 One of the things I planned to do this year at Comic Con was button-hole Jonathan Ross to ask him about his Prohibition-set Vampire-fest Turf, but I over-booked and dropped the ball on the whole sorry scenario. Once again fates have converged to make me end up feeling like the prize bumpkin, as I merrily bundled along to the launch of the brand-spanking new Comic Book anthology CLiNT to nab a quick chat. 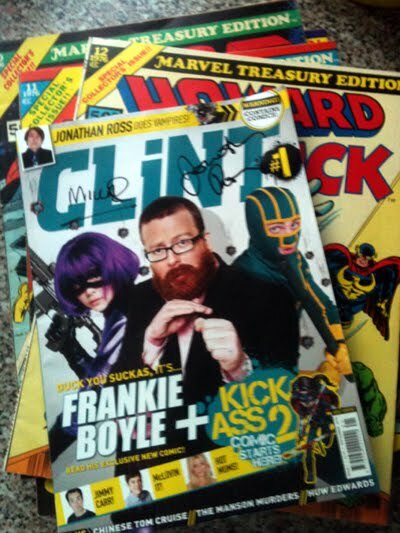 CLiNT has been carefully constructed by none-other than Mark Millar, and features Ross' debut strip in it's first UK outing. Once there I got a call from my cameraman, who'd overrun on a prior engagement, and I was on my lonesome. So mortified by another fumble I failed even to get a lovely snap to enshrine the Kodak moment meeting Messrs Millar & Ross. Hopefully, after making an offer surely anyone would refuse, I might be able to wangle a brief chinwag soon - but let's not be holding our collective breaths. 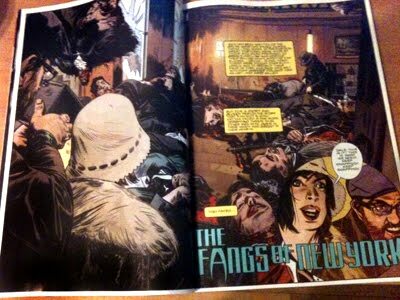 But what of CLiNT itself, as opposed to my regretful ramblings? Waiting in line I had ample opportunity to glance through the pages, and then downright devour them. At first flick it looked a little bit too close to a Comic with some pages from a lads mag meets film rag slipped in - with a feature on Hot TV Mums a particularly out of place filler. I'm not one to dispute the obvious allure of a few yummy mummys, but it's still a confusing thing to find plopped there. 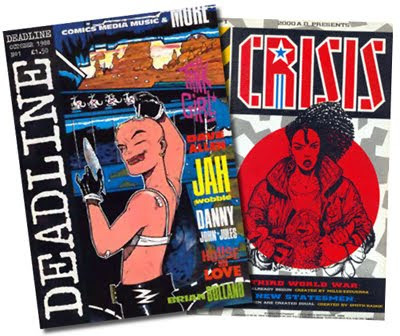 Make no mistake - despite many a US setting this most definitely feels like a Great British Comic Book, and one that recalls the glory days of 2000AD and it's noble 90s spin-offs like Crisis and Deadline. No other country seems to embrace anthology titles like us lot, and for taking me back to the time when - for awhile - grown up comic books flooded the shelves of the local WH Smiths it deserves a hefty chunk of recognition.